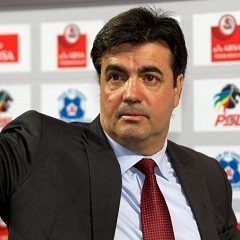 Johannesburg - After taking some time off from soccer, former Moroka Swallows coach Zeca Marques says he is ready to return to the technical dugout. Marques has been out of action since he left Santos last year – “long before they were relegated”, he said. The former Absa Premiership side was relegated from the National First Division to the ABC Motsepe League at the end of last season. But Marques was not entirely lost to football as he was “doing some business related to sports outside the field. “I helped bring FC Porto to the country in September and set up some businesses with my partners. Now that the business is well established, I can go back to coaching because that’s my passion and first love,” said Marques. He wanted to establish links between South African clubs and their counterparts in Portugal, where he was born. “This country has got lots of talented players, but they don’t get opportunities to go abroad. I need to open a channel where some of the youngsters can go and showcase their talent in Portugal because of my contacts there. We need to export more players". The former Black Leopards coach believes he still has a lot to contribute to South African football. “I had offers before, but I couldn’t leave my business unattended. When I take on a project, I go all out and give it all my attention. Now that I’m available, I will focus on getting a club, irrespective of the division". The 56-year-old, who has a Uefa Pro coaching licence, has been around the block and knows South African football inside and out. Known for his habit of sucking lollipops on the bench and for throwing his jacket on the ground in celebration, Marques came close to promoting Leopards to the elite division in 2015, but fell short at the play-offs when Jomo Cosmos pipped them for a place in the Absa Premiership.